Original Editors - Jennifer Colgan from Bellarmine University's Pathophysiology of Complex Patient Problems project. Individuals with the HLA-B27 genetic marker have an increased risk for developing Reiter's Syndrome following sexual contact or exposure to a bacterial infection. This history of infection (enteric or venereal) further increases the risk of developing Reiter's Syndrome. There is a strong prevalence of Reiter's Syndrome in individuals with HIV. The literature states that in patient's who are HIV positive, Reiter's Syndrome is more strongly correlated with male homosexuality than it is with people who have a history of injection drug use or other risky behaviors. Urethritis, conjunctivitis, and arthritis are the three symptoms classically associated with Reiter’s Syndrome, , . Urethritis discharge is intermittent and may be asymptomatic. Conjuctivits is usually minimal. The arthritis is usually asymmetrical and polyarticular, occuring in the large joints of the lower extremities, including the knees, ankles, and 1st metatarsophalangeal. In some cases, hand joints may be involved. 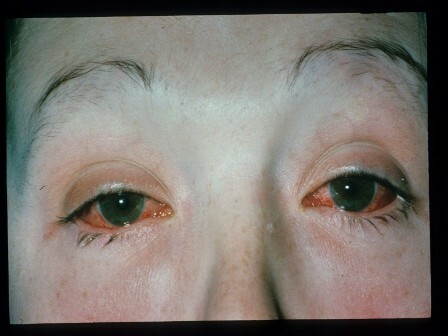 Individuals can also present with fungal infections (uveitis, keratitis) of the cornea. Individuals can present with three musculoskeletal manifestiations including acute inflammatory arthritis, inflammatory back pain, and enthesitis (inflammation of the tendon at its insertion onto bone). It is uncommon for all three musculoskeletal manifestions to present at one time. Enthesitis most commonly occurs at the insertion of the achilles tendon onto the calcaneus causing heel pain. Enthesitis may also occur at the ischial tuberosity, iliac crest, tibial tuberosity, and ribs, with patient complaints of musculoskeletal pain at these sites. It is imperative that a complete and thorough history should be done on these patients during their initial evaluation to rule out presence of Reiter's Syndrome. Reiter's Syndrome can have integumentary manifestions similar to psoriasis, a condition that causes dry, erythematous skin lesions that can occur in small patches or cover large surfaces. It commonly involves the toes, nails, and soles of feet. Reiter's Syndrome is associated with and may be the presenting symptom of HIV. 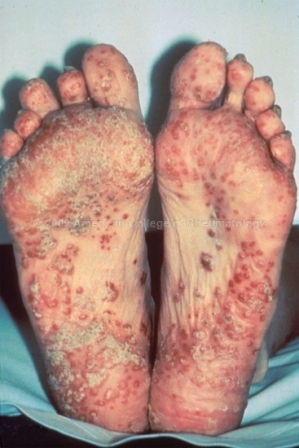 Reiter's Syndrome is also associated with or triggered by Shigella, Salmonella, Yersinia, Campylobacter, and Chlamydia. There is no evidence that antibiotic therapy changes the course of the disorder. NSAIDS are the primary intervention. Below is a list of several more options. Antibiotics for non-gonococcal urethritis in patients with previous episodes will decrease risk of recurrence from 37% to 10%. Due to various manifestations of the disease occurring at different times, a diagnosis may take months to establish. The combination of peripheral arthritis with urethritis lasting longer than 1 month is necessary before the diagnosis can be confirmed. Laboratory tests typically reveal an aggressive inflammatory process. Elevated erythrocyte sedimentation rate (ESR) and C-reactive protein are detected. Other common findings include thrombocytosis and leukocytosis. The presence of certain bacteria in urine samples, genital swabs, and stool cultures can be used to identify the infection through laboratory tests. An MRI is the diagnostic imaging of choice to help diagnose Reiter's Syndrome. The affected bone will present with a moth-eaten appearance, bony expansion, and loss of cortical definition. Bone scans can also be used in conjunction with an MRI and will exhibit increase uptake. The bony destruction lesions can cross epiphyseal growth plates, joints, and discs. Reiter’s Syndrome usually follows venereal disease or an episode of bacillary dysentery, which is a bacterial infection characterized by blood in the stool. Up to 85% of people with Reiter's possess the HLA-B27 alloantigen. Individuals with the appropriate genetic background can develop Reiter's Syndrome through an enteric infection. Bacteria that most often cause infections and Reiter's syndrome are Chlamydia, Salmonella, Shigella, Yersinia, and Campylobacter. These can be manifested from sexually transmitted diseases or contaminated food. Reiter's Syndrome can not be transmitted from person to person. However, the bacteria that triggered the disease can be passed on from one person to another. Musculoskeletal manifestation are acute inflammatory arthritis, inflammatory back pain (in severe cases), and enthesitis. Enthesitis is inflammation at the insertion of tendons and ligaments into bones. Dactylitis or "sausage digit", plantar fasciitits, and achilles tendinitis are the most common sites. Cardiovascular involvement with aortitis, aortic insufficiency, and conduction defects occur rarely. Tetracyclin or erythromycin 500 mg taken orally 4 times per day for 10 days is recommended in treatment of patients with Reiter's Syndrome due to sexual exposure. No treatment is necessary for conjunctivitis or mucocutaneous lesions, although topical opthalmic glucocorticosteroidsiritis may be required to treat iritis . Arthritis is treated with NSAIDs in doses similar to those used for rheumatoid arthritis. Enthesopathy may need to be treated with local injection of corticosteroids, to decrease inflammation at the site of the injection. Surgery is rarely indicated but may include synovectomy, fusion, or tendon repair. Physical Therapy is helpful during the recovery phase of the disease (after exacerbation of symptoms has ceased). Physical Therapy should follow a program similar to that given to a patient with arthritis. Patient education is necessary to promote joint protection and proper body mechanics when performing daily activities to maintain joint integrity. An exercise regimen that includes regular aerobic activity as well as exercises that promote joint range of motion and muscles strengthening should be utilized. Aerobic exercise should include low impact activities, such as swimming, walking, or recumbant bike, depending on the patient's cardiovascular level. Strengthening should target muscles surrounding the affected joints with the purpose of improving its support system. Immobilization and inactivity are discouraged as they can lead to decreased range of motion, contractures, joint stiffness, decreased muscle strength and decreased flexibility, as well as overall decreased cardiovascular fitness, which can cause a cascade effect on other body systems. Goals of treatment should include pain relief, improved activities of daily living, reduce joint swelling, prevention of joint damage and disability. ↑ 1.00 1.01 1.02 1.03 1.04 1.05 1.06 1.07 1.08 1.09 1.10 1.11 1.12 Goodman CC, Fuller KS. Pathology Implications for the Physical Therapist. 3rd ed. St. Louis, MO: Saunders Elsevier; 2009. ↑ 4.0 4.1 4.2 4.3 4.4 4.5 4.6 4.7 Developed by R. Reiter's Syndrome. CRS - Adult Health Advisor [serial on the Internet]. (2009, July), [cited April 5, 2010]; 1. Available from: Health Source - Consumer Edition. ↑ 5.0 5.1 Goodman C, Snyder T. Differential Diagnosis for Physical Therapists: Screening for Referral, 5th ed. St. Louis, Missouri: Elsevier; 2013. ↑ Lonnemann E. Spondylogenic & Immunological Disorders. [PowerPoint]. Louisville, KY: Bellarmine University Doctorate of Physical Therapy Program; 2014. ↑ Guide to Physical Therapy Practice. 2nd ed.Phys Ther. 2001; 81:9-744. American Physical Therapy Association; Alexandria, Virginia.